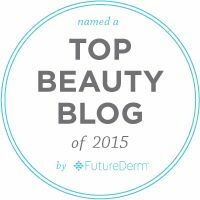 If there is one thing for which I am a huge sucker, it is holiday beauty goodies. Palettes and bundles and bags. Oh, my! I see pretty packaging and special colours and Limited Edition all over the place and I am a babbling idiot in my helplessness to resist. If I want it, can possibly afford it, I am going to buy it. So far, I have indulged in a few Tarte Sweet Dreams holiday goodies and this is the first one to arrive on my doorstep so that I can share it with you. 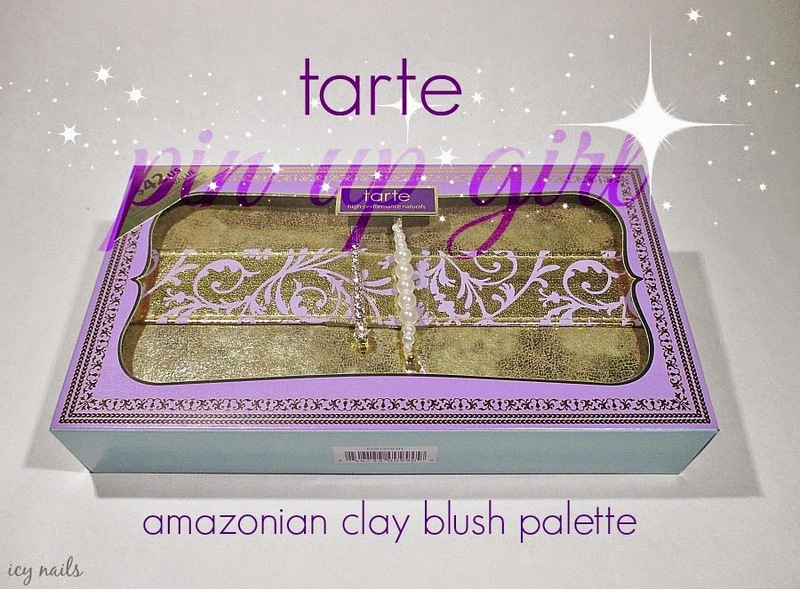 This is the Tarte Pin Up Girl Amazonian Clay Blush Palette. I missed last year's version by thismuch. I had it on my wishlist but by the time I had the money to spend on it, it was all gone. This year, I made sure to not miss out. 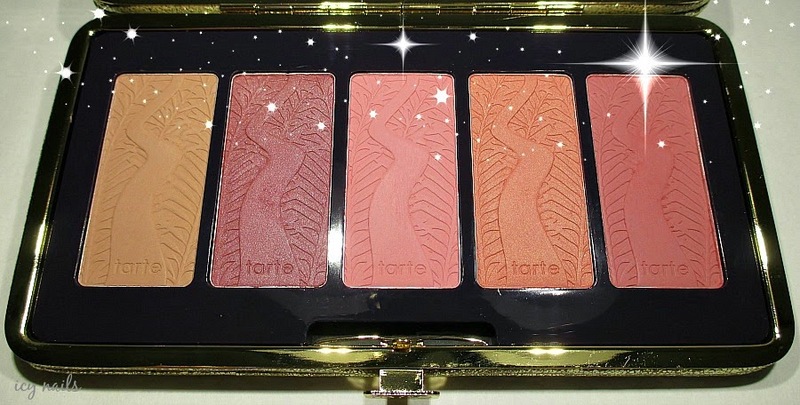 The packaging on the Tarte Pin Up Girl blush palette is simply beautiful. It is modeled on a vintage clutch evening bag, lightly padded and covered in a slightly worn, antiqued gold synthetic leather with a shiny gold, lavender printed ribbon running lengthwise across the top. There is a gold tone frame and a push button closure. On the ribbon is two gold tone hair pins, one larger one with graduated faux pearls and the smaller with clear crystals. The hair pins are pretty but I don't know how well they work, I have yet to wear them. I can't... It makes me slightly crazy that there are two unmatched hair pins. It messes with my sense of equilibrium, symmetry and balance. I would have made sure that there were two matching hair pins. 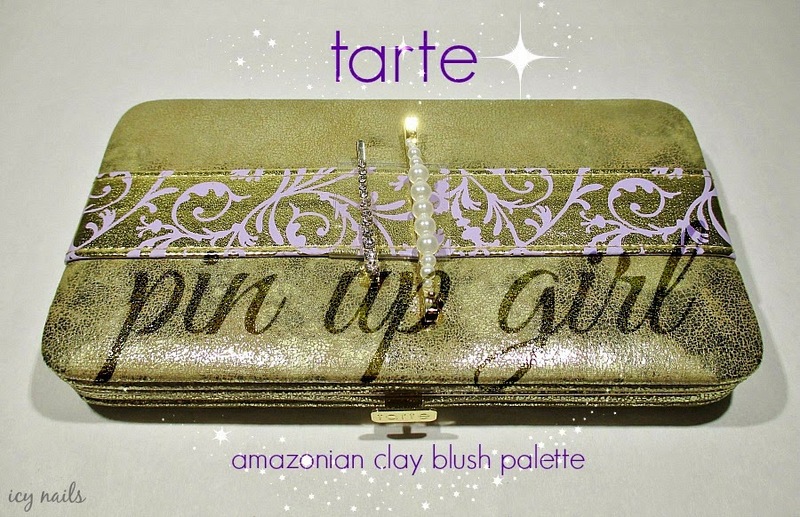 When you push the little Tarte embossed button on the front of the palette, the lid opens to a glossy, purple and gold framed large mirror in the lid. 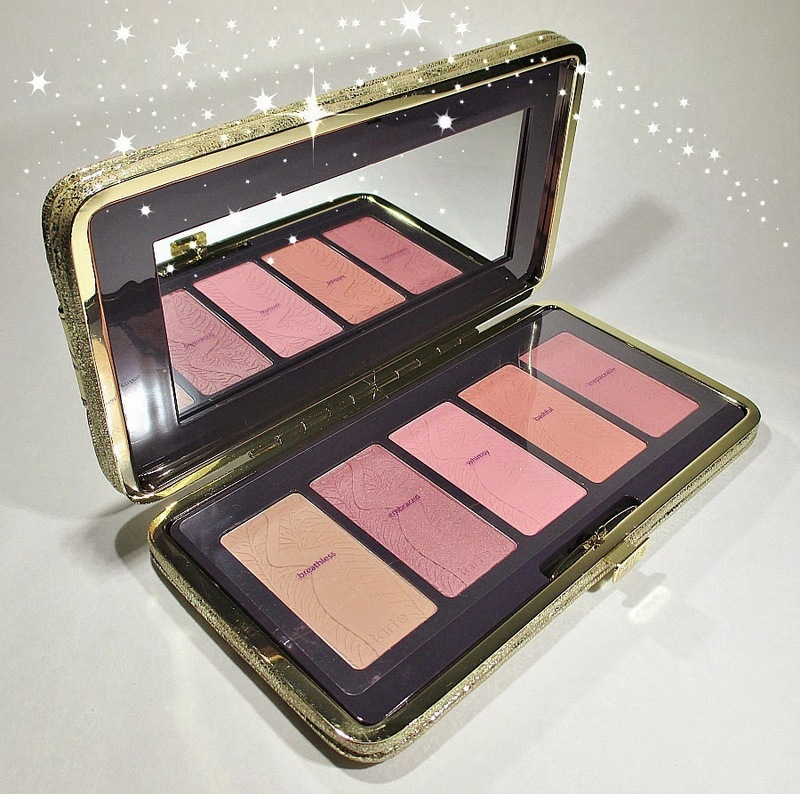 Nestled in their own purple and gold frame is the five rectangular Amaznian Clay Blushes. The only place you will find the shade names is on the clear plastic slip cover. *sigh* Really? There is plenty of room to emboss the name of each blush on the frame, they could have also been printed on the back of the palette. Now I have to write them on the packaging, myself or try to keep track of that stupid bit of plastic film. A little close up of the blushes in their beautiful nest. Five wearable, versatile, flattering shades that will impart a beautiful, lasting flush to your cheeks. Breathless: Matte, soft peach. 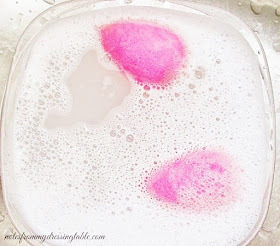 This can be a blush for very skin or a highlight for darker skin tones. Embraced: Softly shimmery plum rose. The formula on these blushes is beautiful. They are silky smooth to the touch, ever so slightly powdery but beautifully pigmented with great colour payoff on the skin. I can wear Tarte Amazonian Clay blushes all day without having to touch up. At 0.158 oz each, these blushes are just a little bit smaller than their full sized, individual counterparts. Five individual Amazonian Clay Blushes would run you $130.00. This palette is $42.00, a $113.00 value. You can find this palette at Sephora or on their website. This is a limited edition palette and once they sell out, they are gone for good. If you would like to grab this one, do it fast. Did you get this palette or any of the various holiday offerings? Do you plan to? Please do tell what you picked up. Maybe I'll get further enabled. As if I really need that... I went a little overboard on Tarte holiday goodies. But they are such a good deal and I couldn't resist. Yay for pretty holiday makeup bundles that last for a long time and bring you beauty for months, even years after. Thank you so much for coming by and reading this review. Enjoy your shopping and have a beautiful day! What a pretty blush palette this is! The packaging on it is beautiful and the blush selection in here is lovely. I've heard great things about their brushes but I haven't tried them. I like Tarte blushes, I own two shades if I'm not mistaken. And yes, I love holiday sets... in fact my post today is all about holiday sets... guess what? Oh, this is gorgeous! I'm putting this on my birthday list! This palette is every.damn.thing. Need. Such a pretty palette! If I weren't on a budget and having to pick and choose which holiday items to get I would snap this up. ACK I need this in my life. It is beautiful and any makeup lover would be over to moon to open this up. I agree! Palettes without names drive me nuts, as I have to find a way to label them myself. No bueno! I hope that you get it, it's gorgeous. Don't hesitate too long. I did last year and missed out. I know... The packaging, the Christmas of it. I am a sucker. If I had the means, I would buy all of the holiday things. They are so good. Worth the money, IMO. The AC blushes are so pigmented and wear so well and one lasts a long time.